I know that my blog has been a little quiet lately and I am okay with that. Sometimes, God has me in the quiet places so He can speak truth into my life. Recently the Lord woke me up so I could listen to His message for me. I continue to work with the DaySpring’s Blessings Unlimited Products – asking God to reveal to me how to teach His truths through these beautiful, inspiring products. Recently, I woke up in the middle of the night with the Blessings Unlimited 4 Seasons Watercolors product in mind. I had to get up and write down what was on my mind as I knew that God was planting a new speaking topic for my ministry, especially since I have just entered a new season in my life – the empty nest. Today, I was again reminded of this message as I received an order for this product. I know that you will find yourself in one of these seasons as you read this post ~ I pray that you will also find truth for your life. “The warm, natural images refresh the spirit, and the specially selected Scriptures renew the mind with promises of the faithfulness of God to protect and provide for us through each season of our lives. Each unique print is mounted on a solid resin board that can be hung with two saw-tooth hangers on the wood-stained back or set on a table, shelf, or mantle. Each measures 11 1/4″ x 18″ x 1 1/4”. 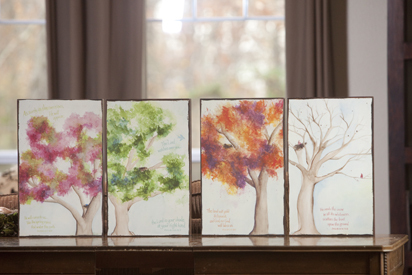 A woman’s life can be defined by different seasons ~ each panel of the Blessings Unlimited 4 Seasons Watercolors reveals the unique seasons. Spring (1st panel) – Represents a time of creating a home with the potential to bear,. There is great excitement and ideas, but she will need support and nutrition (fertilization) from her Heavenly Father. Summer (2nd panel – Represents a busy family time with children in the nest or career in full swing. It seems as if there is no time for herself, she will need the support and rest (daily watering) that can come from her Heavenly Father. Fall (3rd panel) – Represents a time of transition from busy family days to wondering what God’s next calling in her life will be. She is learning how to let go, to find fulfillment in walking alongside her family in new ways,. She will need a strong faith (healthy root system) with her Heavenly Father to allow her family to fulfil God’s purposes for their lives (the leaves to fall). This is my current season of life. Winter (4th panel)– Represents a time for reflection and strength as she will encourages the next generation of women. All that God has taught her through the years of fertilization, watering, developing healthy roots and releasing seed to continue bearing will reveal her strength, beauty and most of all her faith in her Heavenly Father. What season of life are you finding yourself in at this time? Are you drawing on your Heavenly Father for nourishment and support? Please share what the Lord is teaching you at your current season. Yes, Sandy, I am also in that “Fall” of life… learning how to let go, finding fulfillment in new ways, and digging deeper roots in my faith. I’m so thankful that God helps us through each “season” in life – Heb. 46:11 – NEVER letting go of us! I am in the winter of my life, reflecting on what God has for me, I got a late start because my other seasons were marred with pain, destruction, betrayal, hurt and emptiness. I relied on other things instead of trusting in my Heavenly Father. Now that I am alone (in the natural) I am able and willing to accept that I was always loved and because of that Agape love, I was able to get rejuvinated and move to that “rock that is higher than I” and for that Ia m grateful to my God! I am sorry that these images are no longer available through Blessings Unlimited. I have done several retreats speaking on this topic and often the retreat committee will create something similar from images found on the computer. I loved using these images and were sorry when they were removed from our catalog.